Latin Roots: East Harlem is a living history program honoring seven local heroes: Marcos Dimas, Artist and Artistic Director of Taller Boricua, Dr. Georgina Falu, Scholar, Educator and Entrepreneur, Aurora Flores, Journalist, Music Historian and Musician, Juan Gutierrez, Musician and Community Leader, Iris Morales Community Activist, Educator and Film Producer, Piri Thomas (dec.) Poet, Novelist, Activist and Educator and Carmen Vasquez Community Advocate. 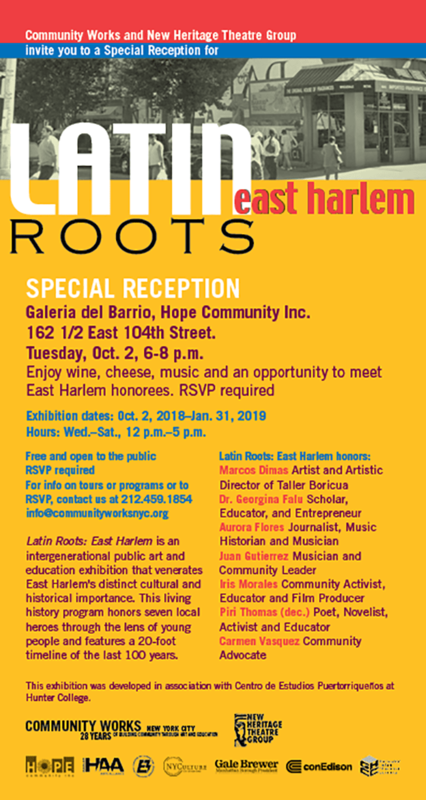 All are invited to join in this free special celebration on Tuesday, October 2nd from 6-8pm at Galeria del Barrio, Hope Community, Inc. located at 162 1/2 East 104th Street. RSVP is required. Latin Roots: East Harlem is part of Community Works‘ ‘Harlem is Legacy’ Project, preserving and documenting Harlem’s rich history and traditions. This exhibition was developed in association with Centro de Studios Puertorriqueños at Hunter College.